“Delivering Happiness” has been on my to-read list for years. When I started writing for Helloify, I finally bought it on Amazon and read through. It’s an important book and especially relevant to what I do at Helloify because the author Tony Hsieh (pronounced Shay) pioneered online, support driven business by founding Zappos. Zappos is an online shoe company founded by Hsieh in 1999 before being acquired by Amazon in 2009 for over $1b. Hsieh published the book in 2010 and it was a bestseller. But the release date lagged behind much of the impact that he had just by building Zappos for over ten years. Hsieh is a quiet person, with ideas that are nothing short of rebellious. Take just about any commonly held business belief about company operations and it’s likely that he holds the opposite, and has a thoughtful reason. One thing you’ll learn reading through this article is that the trend of transparency in internet business may have been Hsieh’s innovation. You may point out that Pat Flynn released his first income report in 2008, and Hsieh published his book in 2010. That’s true, but remember that in 2010 Zappos was very mature. The ideas that Hsieh put to paper had already been in action at Zappos for years and thus had their effect on internet business well before 2010. I also should point out that Tony has a quite fortunate financial situation. He sold his first company, LinkExchange, for hundreds of millions of dollars and is effectively set for life. The reason he didn’t stop after his first big payday is because he’s just wired to build things. He doesn’t want to retire, he wants to run a company. For that reason his advice may not be for everyone, but I think we can look at many of the ‘extreme’ ideas that Tony experimented with at Zappos and see if there are lessons we can implement into our more humble operations. Here are the 6 action items I took from Delivering Happiness, and how you can implement them in your business. Hsieh was in the first batch of folks who played the long game in the internet business world. And even in that elite group, he stands out due to his emphasis on human systems combined with computer systems. Tony Hsieh’s looked at the nature of Zappos’s business, and decided to break from his peers, Amazon and Google, who prefer self-service products and automation. Tony realized that mimicking other companies just wouldn’t work for him. It’s imperative for Zappos to handle a high volume of returns and customer service requests simply due to the nature of the shoe business. So he built a culture of supporting happy employees and happy customers to meet the challenge of selling shoes over the internet. At a high level, you need to consider your business realities, and use them to formally define your company purpose. Once you decide your purpose, be transparent about it internally and publicly. How you do that concretely is with a mission statement. Mission statements were designed as a way to focus large companies’ operations. But somewhere many have lost their way and resorted to vague, meaningless babble. The best mission statements are short and definite, without any vagueness or buzzwords. Just look at a few examples of what not to do – most of the F500 have undefined aspirational missions, incomprensible and resembling satire. Here’s what to look at for inspiration. The power of these two mission statements is that they are concrete, ambitious, and describe what the companies in simplest terms, while still giving flexibility in how they will accomplish the mission. By defining a mission, you take the first step of giving your business a life of its own. With the right mission, your company is not just the combination of all employee’s traits, but an intelligent organism. Plus, mission statements provide a practical test for you to run any decision through. Is your decision congruent with your mission? If not, don’t do it. The Helloify mission is to becomes the easiest way for any company to offer world class sales and support. While it’s early days, the product and business as well as our content will evolve over time consistently with this mission. With a mission statement, Zappos consciously created a work environment they felt would fit their goals. The next step is to establish some rules to uphold that environment. In Chapter 5 we read about how Zappos created a set of 10 “family values” (defined on the website). Because of Zappos’s scale, Hsieh had to take a bottom-up approach by requesting suggestions from his staff via email. He parsed through, picked out recurring themes, and used them to create the values. Zappos only hired people that, as a group, they felt were a ‘culture fit’ who would be able to abide by their values – they quickly canned anyone who didn’t share their vision. Finally – they posted their values in places where both management and staff would see them everyday. Zappos was running a huge company, so don’t borrow entirely from their playbook. If you are running a very small company, I would recommend you come up with the rules and guidelines yourself, not as a collaboration. If you don’t know where to start, do every critical business task yourself so you know what’s important and what’s not. If you have a physical office, post these for everyone to see – if you have a distributed team, review the code often on your regular calls or have them visible inside your project management software where you and your employees will see them daily. Hsieh figures that to provide a great customer service interaction, his employees need to feel good about their own company and be as empowered as possible. In a sense, customers can ‘hear’ the work environment of Zappos echoed in all touchpoints. So even if it’s possible for Zappos to rationalize away any of their problems, customers won’t be fooled. In Chapter 5, Hsieh talks about Zappos’s “culture book,” which employees, customers and business partners use to anonymously write their honest thoughts about the company and where it’s headed. Because of the culture book and other rituals Zappos uses to expel bad practices and friction from the workplace, their customer service machine hums efficiently. Again, we return to a fundamental question – what matters to your business? What you measure and focus on is what you can improve. Implement your own structured rituals to promote frank and honest feedback between management and reports is key. This can be powered by employee engagement software like 15five. Use your social media for conversations and listenings instead of just broadcasting. Here is an example of Misfit (via Twitter), a cutting edge wearables company, fixing an issue many of their customers had by issuing replacements. Zappos is all about one thing: creating the best customer service experience. 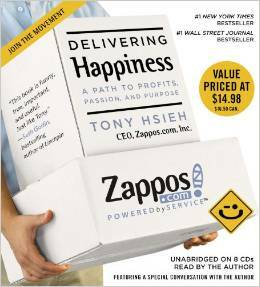 Hsieh argues that positive customer interactions with Zappos employees in the call center drive repeat business. These positive customer interactions by highly skilled support staff drive repeat business and lead to word-of-mouth and referral traffic. Put equal or greater resources into decreasing churn and increasing referral and word of mouth, versus just increasing conversion rate and closing more accounts. It’s less expensive to maintain the customers you have than it is go out and find new customers. Traditional commission-based compensation encourages salespeople to seek and destroy, but to reduce churn you make it attractive for your team to to bring in customers that are actually right for your business. Tint, a profitable social media SAAS company in San Francisco, went so far as to restructure their compensation structure to reward support staff fairly. The idea is to avoid wasting resources closing customers who will cancel in just a few months. For a more rigorous dive into the study of churn, (which just may change the way you run your businesses) read up at Shopify’s blog and at Saastr here. Transparency is a powerful tool when you are at the center of an ecosystem. This Transparency helps to get everyone on the same page and lessen chance of miscommunication with your team, your ecosystem partners, your investors, and customers. Given good information, people and organizations can mobilize to solve problems. Zappos was having issues with part of their supply chain, so they created “the extranet” which is a feature on its site that allows vendors full access to inventory levels, sales, and profitability. Vendors can also write suggested orders for Zappos buyers to approve and communicate with Zappos’s creative team to make changes to their brand boutiques on the site. The most popular forms of transparency online are: income reports, salary information, and culture codes. Salary information and culture codes are reserved for bigger companies, so I will focus on income reports. Write down your process handling customer support. What are common requests, and how do you usually resolve them? Take stock, and write a guide which is so simple a caveman could execute. That’s your system. If you’re brave you can take that document, and hire someone to supplement your customer support operation. But systematization is truly a lifetime goal you should strive for. It’s important to study even if you can’t immediately implement, because knowledge of systems thinking can help you can steer clear of building a company that is impossible to systematize. For a manifesto on building systems read “Built to Sell” and “Work the System”. I prefer Built to Sell because it walks you through concepts in a narrative arc of a man who wants to systematize and sell his company, instead of being more of a thinkpiece, as we see in Work the System. For PhD level credit in building systems, read Taylor Pearson’s blog and listen to “If It Makes You Money You Shouldn’t Be Doing It” on the TropicalMBA podcast. If there is one foundational theme of Delivering Happiness that Hsieh keeps coming back to, it is the importance of company culture and customer experience. Both of these are issues for huge Billion dollar companies, as well as startups and solo operations.